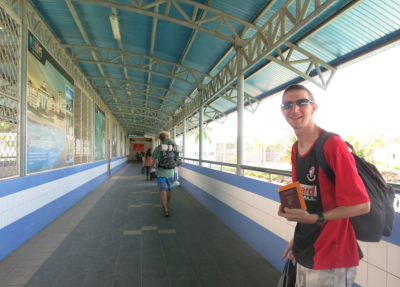 There was something special for me when I went backpacking in Brunei in 2013. It was a milestone I had never thought possible. 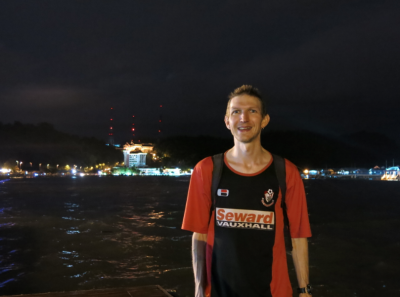 I cracked the 70 country mark when I got the ferry from Malaysia to Brunei, taking the Labuan to Serasa crossing before heading to Bandar Seri Begawan, the capital city of what is a small country. 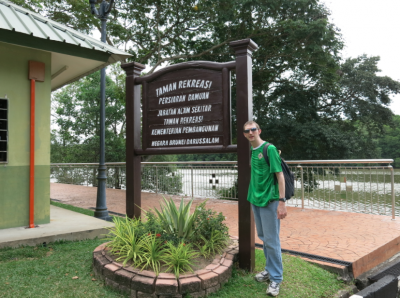 When you are in Bandar Seri Begawan, there isn’t an abundance of things to see and do unlike a lot of world capitals, but I’ve plumped for a top 10 here to keep you all ocupied in the capital. 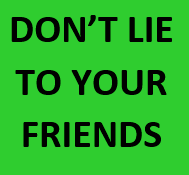 Partying, drinking and dancing simply are not options here – it’s a strict Muslim state and while you can take alcohol into Brunei if you are a non-Muslim, at night time, the capital Bandar Seri Begawan tones down to a halt. Night fall on Brunei’s capital city, Bandar Seri Begawan. There’s nothing much happening here once the restaurants shut. Apart from drinking a few cans of beer in my mate’s hotel room (drinking in Brunei), we were back in our hostel before 10pm each night and I simply had a few coffees, did a bit of blogging and went to sleep. 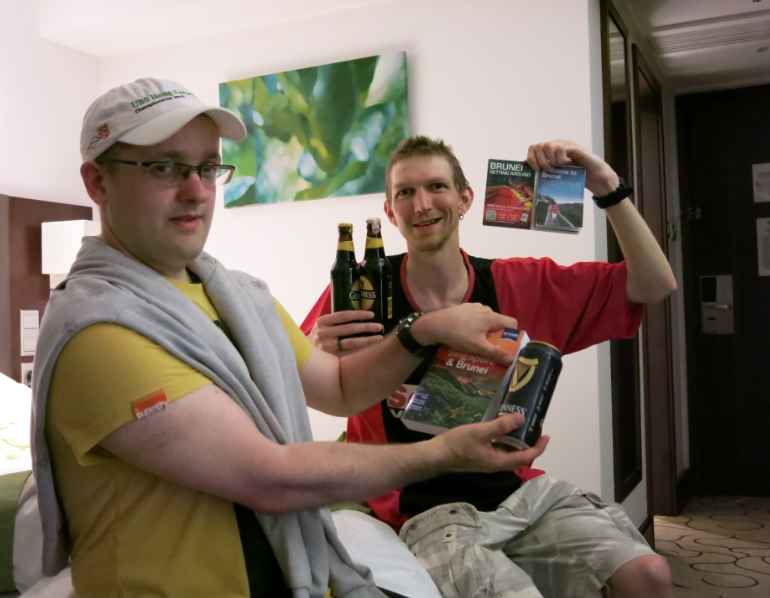 Having a few cans of beer in Brunei with my mate Neil. However, I liked Brunei and I admired Bandar Seri Begawan for this. It’s not a fast paced capital – it’s a slow moving, tranquil and relaxed place and while we toured the capital over a couple of days, it’s easier to write about a top 10 things to see and do for you. This was my personal highlight from backpacking in Brunei. 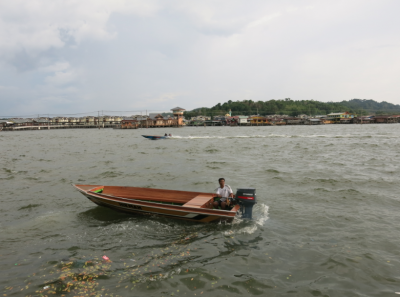 Kampong Ayer, while being officially part of Bandar Seri Begawan is like another village altogether. It’s been classed as “The Venice of Asia” and is a place with charm. It’s an old fashioned town built on stilts on the river. Walking around and exploring Kampong Ayer is free. It’s great for taking photos and having a leisurely stroll. 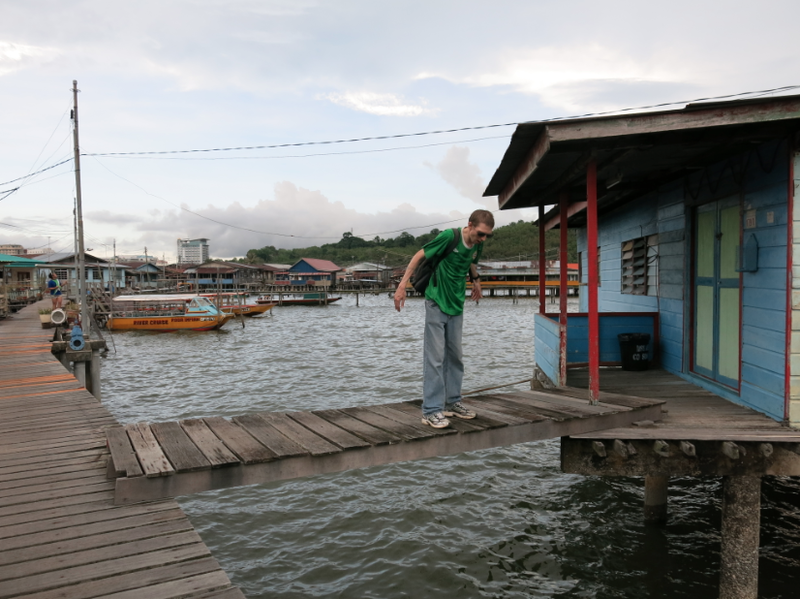 Touring the village on stilts, the Venice of Asia, Kampong Ayer, Bandar Seri Begawan, Brunei. 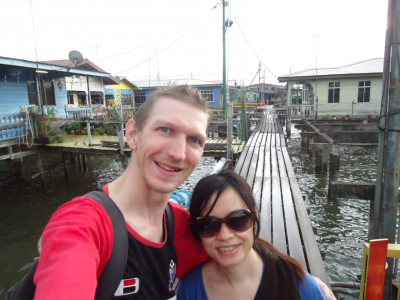 There are also a few Mosques to see over on Kampong Ayer. 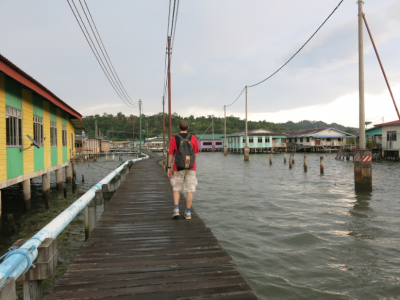 Getting there and back is also cheap – just 1 Brunei Dollar on a boat – hail the boat over and off you go! Check out my longer post on exploring Kampong Ayer. 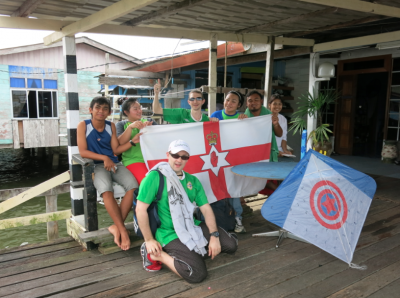 Meeting the locals in Kampong Ayer and flying my travelling Northern Ireland flag. 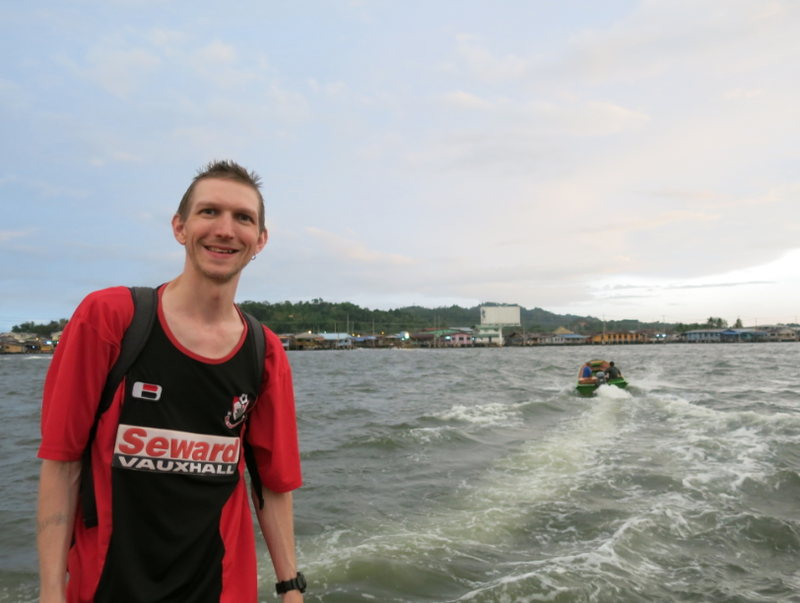 Incidentally I haven’t included a boat trip in this top 10, because it’s a given that you will use a boat anyway to get to Kampong Ayer and back, and if for some reason you decide not to see Kampong Ayer, then make sure you take a boat cruise along the river instead. 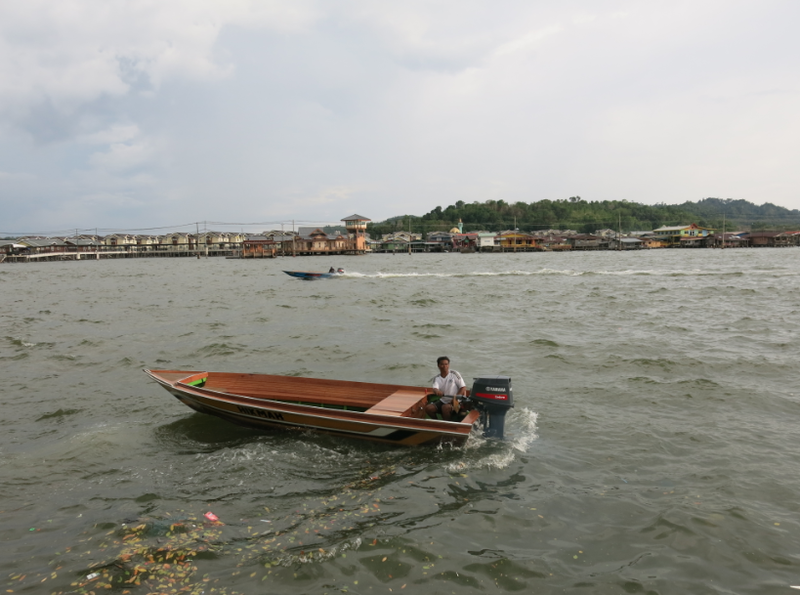 The boat to Kampong Ayer in Bandar Seri Begawan, Brunei. OK as Mosque’s go, this one is spectacular and immaculate. 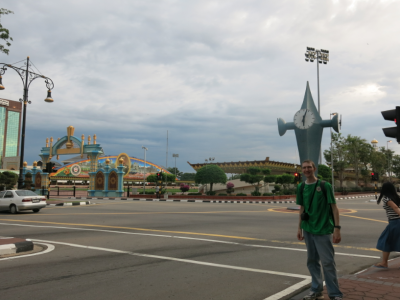 It’s a short bus ride from the city centre bus terminal and I covered it in some detail before – largest Mosque in Brunei. 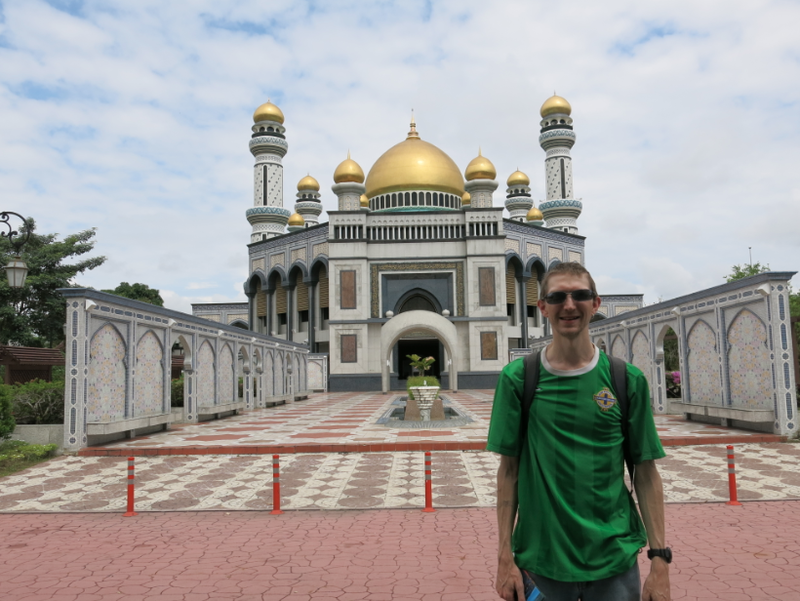 At the Jame Asr Hassanil Bolkiah Mosque in Bandar Seri Begawan, Brunei. 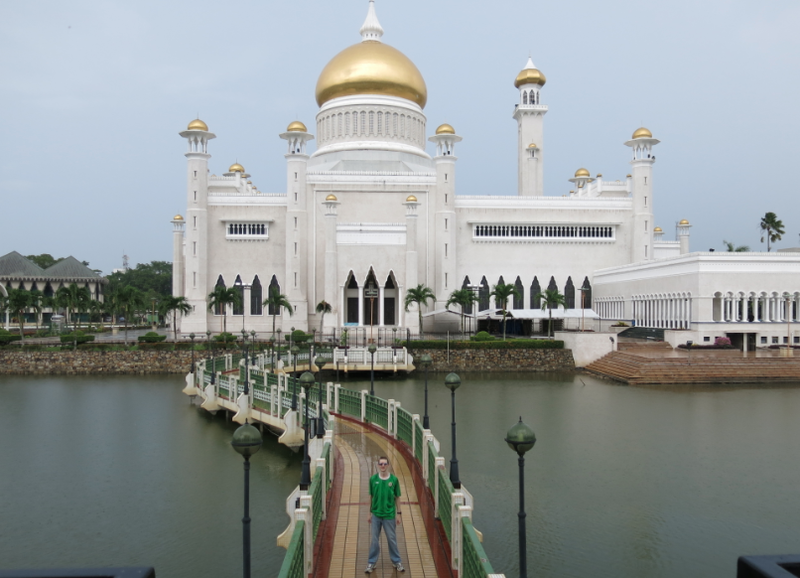 Again – this is yet another spectacular Mosque and is more pretty than the Jame’Asr Hassanil Bolkiah. 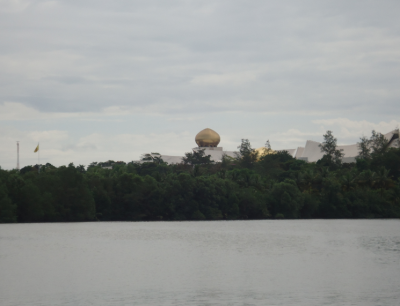 It sits in downtown Brunei overlooking a lake. When the call to prayer comes each night, listening on in the tranquil city centre can be inspiring. I also covered the Omar Ali Saifuddien Mosque before. Visiting the Omar Ali Saifuddien Mosque in BSB, Brunei. This market sells a mixture of food and gifts and was round the corner from our hostel (JH Sun Hostel). Worth a quick look, though when up against to Chinese, Thai and Cambodian markets, this one is average in comparison. Kianggeh Market in Bandar Seri Begawan, Brunei. 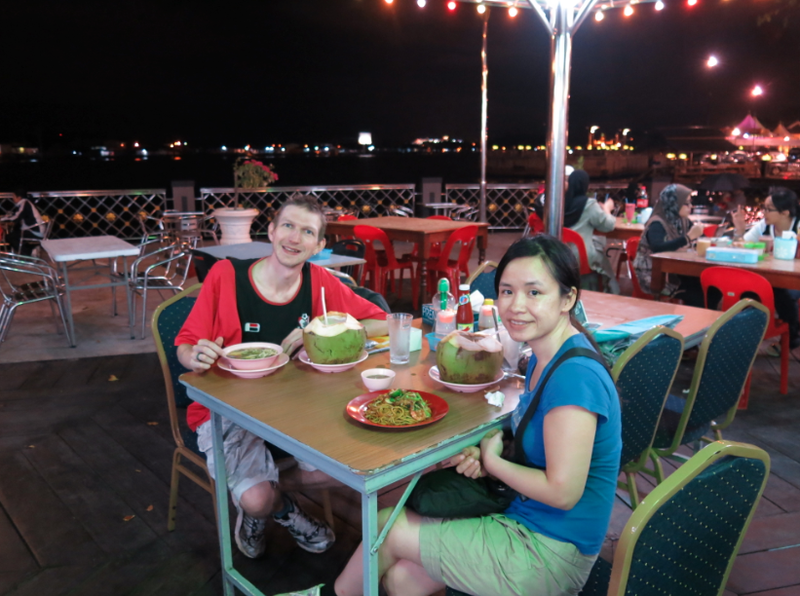 Strolling along the waterfront by day and night provides great views across to Kampong Ayer. 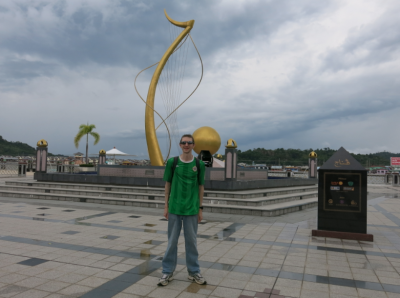 Down by the waterfront in Bandar Seri Begawan, Brunei. 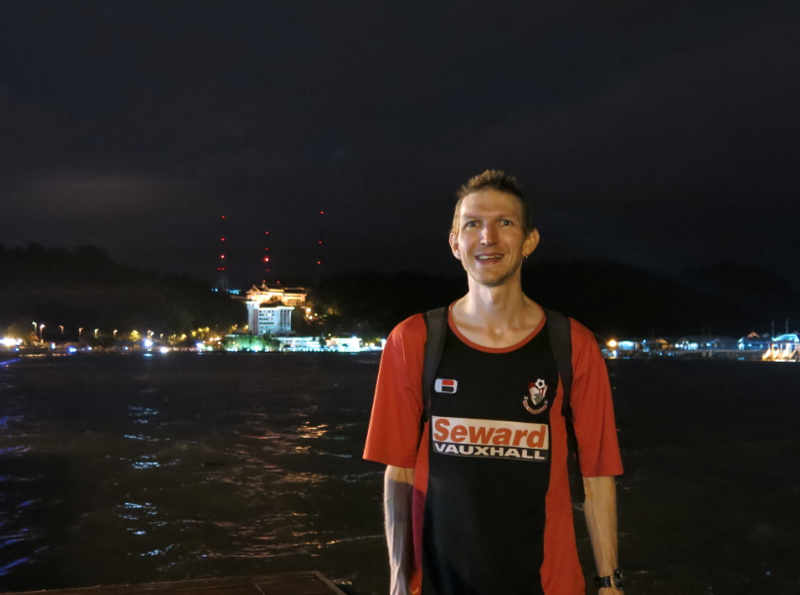 Views out towards Kampong Ayer from the waterfront in Brunei. Those into their British history and influence over Brunei will be intrigued by this cool building that now acts as a free museum. 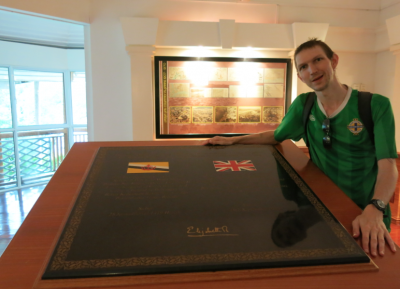 Lots of information on the British rule and the later independence of Brunei. Inside the Bubungan 12 Building in BSB, Brunei. It is referred to as the Bubungan 12 Building as it was a 12 roofed mansion built by the British. 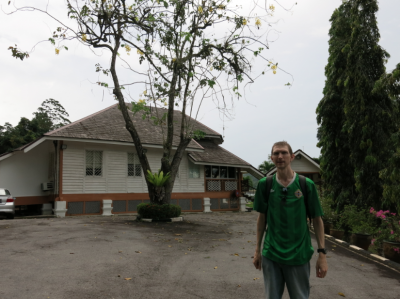 Backpacking in Brunei, outside the Bubungan 12 Building built by the British in Bandar Seri Begawan. In all sincerity, this palace is hard to get to. It only opens to the public once a year and viewing is highly restricted. The nearest we got was walking by the river and viewing it through the forest but you might want to give it a try and get closer. We weren’t that bothered in the end, but we did see it from afar. 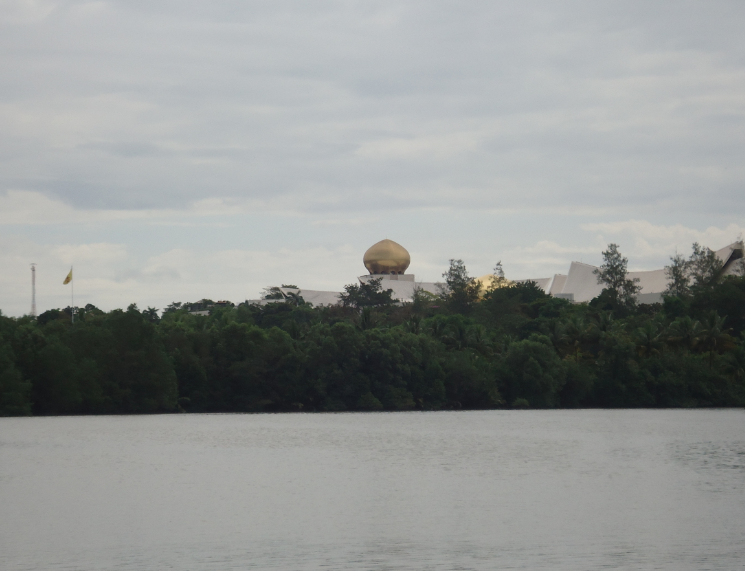 View of Istana Palace from afar. Possessing 257 bathrooms, this is also the largest residential palace in the world. Riverside area where we walked to view the Istana Palace from far away. At night we ate here in this cool open air (but covered) food court. 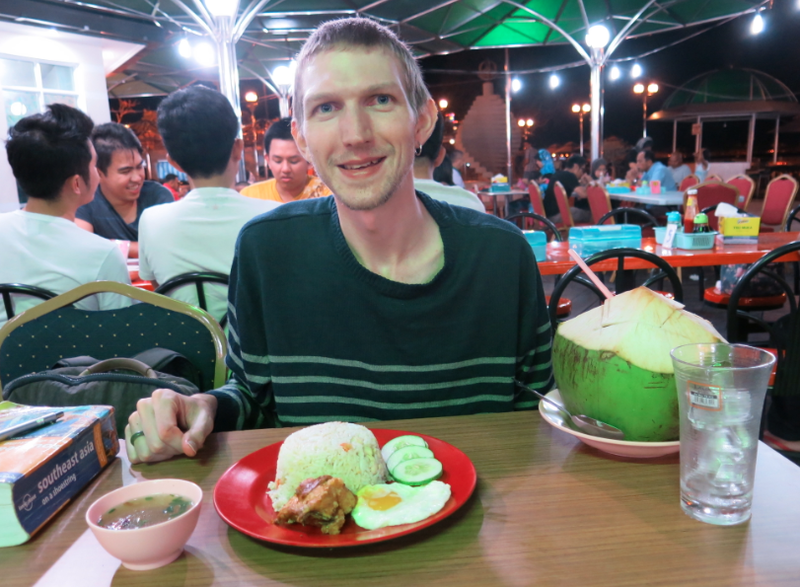 Coconut juice and a range of typically Brunei or Malay (more likely) style dishes are available. 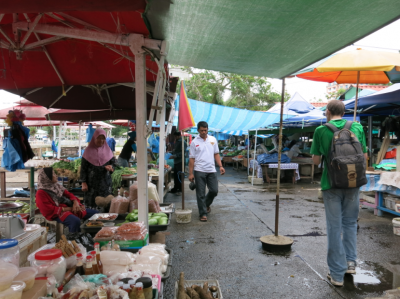 Prices were cheap enough – Some of my Friday’s Featured Food came from Brunei – Soto Biasa Brunei and Brunei Cheesecake. Eating at Kianggeh Food Court. Dinner at Kianggeh Food Court in BSB, Brunei. 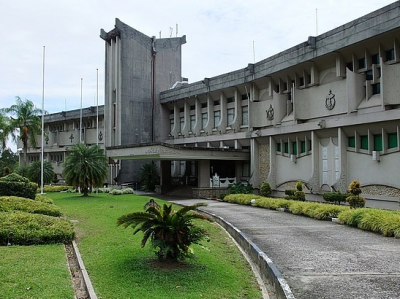 This is an enclosed courtyard complex bang in the city centre named after one of Brunei’s most famous Sultans, not only was Omar Ali the first minister of defence but he is the father of independence and the architect of modern Brunei. I’m not a big fan of museums as you know, but I respect that a lot of you are and might be keen to check this one out. For me, the British Bubungan Building was enough to sample Brunei’s history, but the museum has the advantage of having an Islamic Art Gallery, a traditional culture gallery and has a few different buildings within the complex. The Oil and Gas industry section is the most interesting, as we all know Brunei makes money from its resources. Plus if you have time in Brunei, you can get way out of the capital city over to Kuala Belait for an oil rig tour (they’re not cheap). Museum entry is free though. Backpacking in Brunei – Bandar Seri Begawan top 10 sights. 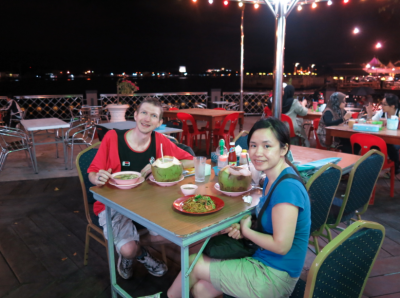 This entry was posted in Asia, Bandar Seri Begawan, Borneo, Brunei Darussalam, Destinations, Kampong Ayer, Lists, My Top 5s. Bookmark the permalink. Did you also go to Bangar and Ulu Temburong (not cheap) or the hiking trails (cheap) to Bukit Patoi? 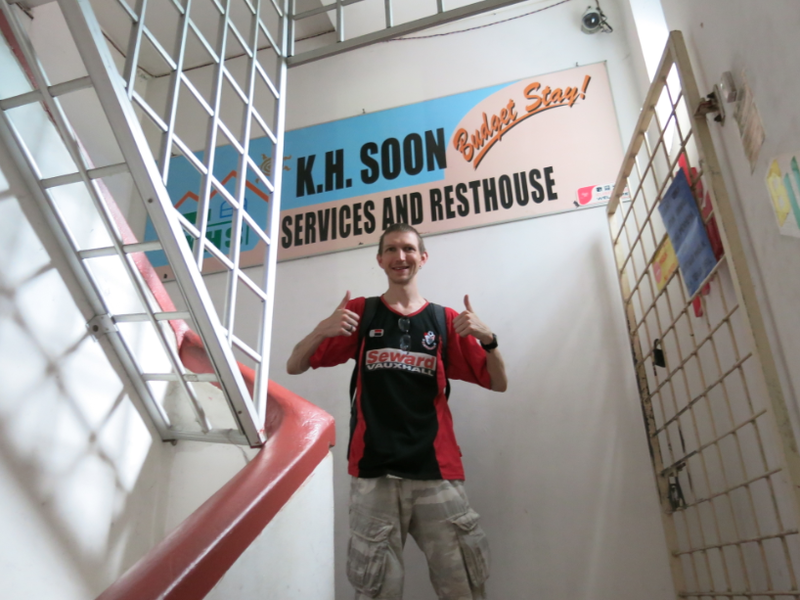 KH guesthouse rates as one of my worst guesthouses/hostels I have stayed at but I haven’t traveled as much as you. Bukit Patoi is a hike to a mountain that is just outside Ulu Temburong National Park and it looks like a nice self guided jungle hike. 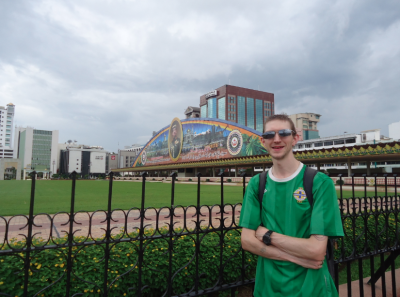 I think Brunei is a new inspiring destination to travel. But as I read some articles, there is only a few public transportation. 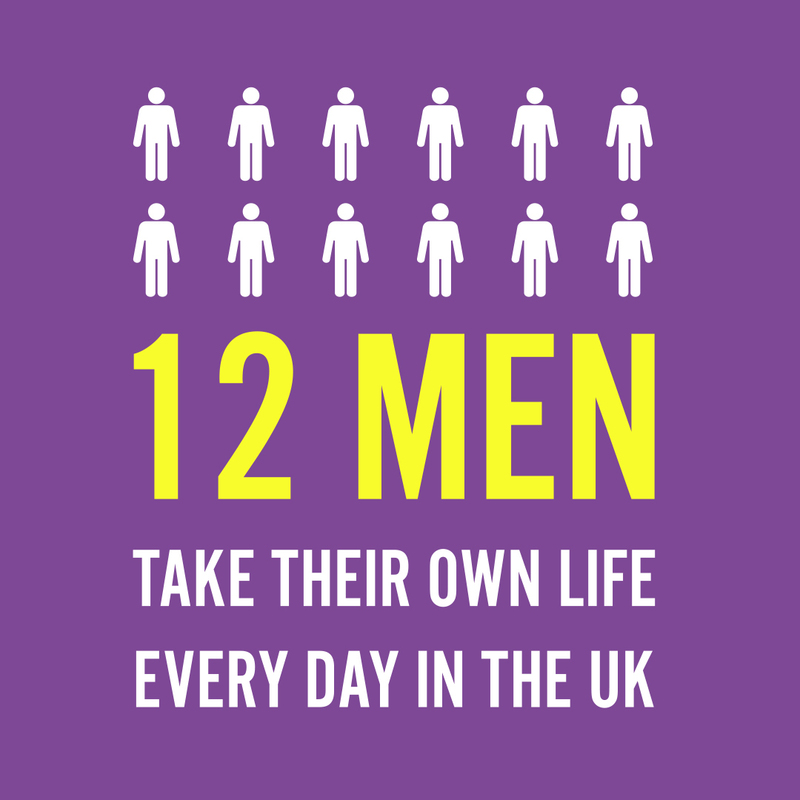 How did you go from one to another place? is it far to go by walking? 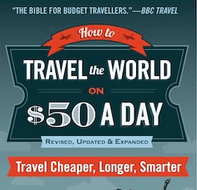 How long did you stay at Brunei, and could you please summarize the total amount did you spent? 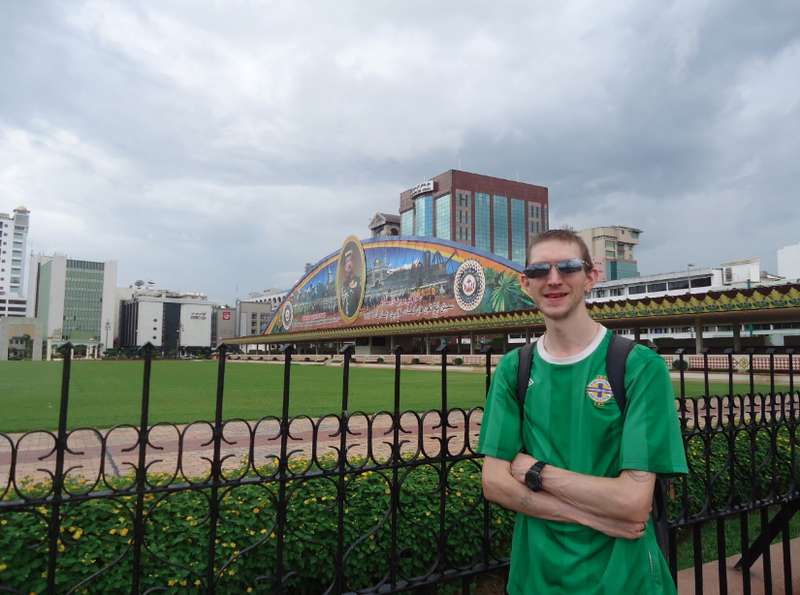 It seems you have enjoyed your tour in Bandar Seri Begawan! Thanks dear for sharing your amazing experience with everyone. Learn so many new things from you. Keep it up dear!